Travelers are not only looking for white sand and crystal water in a beautiful island, they are also searching for sandbar, a bar of sand formed in a sea or river by the action of tides or currents. One of the stunning sand bars in the Philippines is can be found near Maniwaya Island in the province of Marinduque. It is called Palad Sandbar. From Manila, take a JAC/JAM Liner bus bound for Lucena, Quezon. Bus terminal is located in Buendia and Kamuning in Quezon City. Fare is round P200 – P250. From Lucena, head to Dalahican Port and ride either Montenegro and Starhorse going to Balacanan port in Marinduque. The shipping fare is usually P260.00. From Balacanan port, ride a jeepney or van going to Sta. Cruz. Fare will cost around P80. The driver will drop you off in the town proper of Sta. Cruz. Take a tricycle bound for Buyabod Port. Then hire a motorized boats that will bring you to Maniwaya Island. 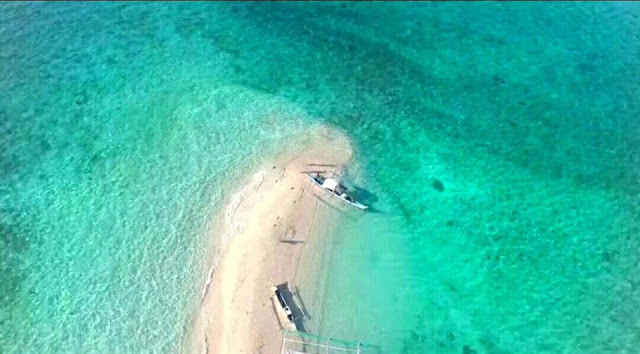 Aside from the Palad Sandbar, you can also visit Ungab Rock Formation in Mongpong Island. The cove located in Sitio Ungab boasts of an eye-catching rock formation that towers about 100 feet above the water. There are no hotels or resorts in the island. Pitching tent is allowed. If you will spend your vacation or Holy Week 2017 in Marinduque, put the Maniwaya Island and Palad Sandbar on your bucket list. It's a perfect destination for those who want adventure and want to escape from the busy Metro.